Have a go at this fun, seasonal craft – this makes a great activity to do with older children too! When October comes round, we delight in all the crafting possibilities the season has to offer including Halloween pumpkin carving. With these easy-to-follow instructions, our crafting team bring you the best Halloween pumpkin carving tips and techniques to create an original design and expert finish. 1. Start by cleaning your pumpkin using some hot soapy water. It doesn’t matter too much as it’s usually dark when they’re on display, but if you’re keeping it indoors it’s a good idea to clean the mud off! 2. 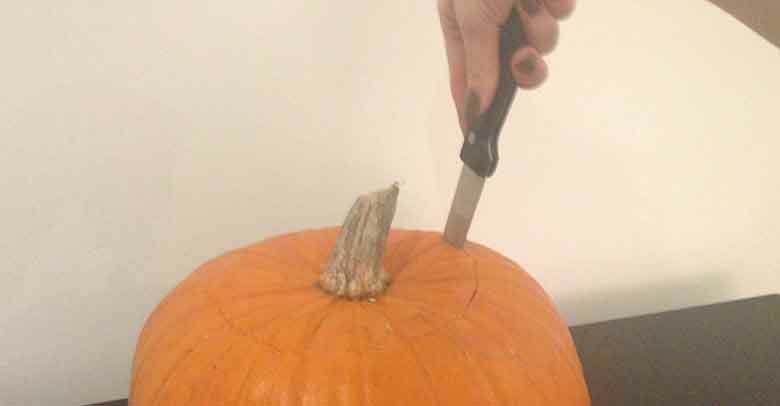 Using the large knife, carefully cut a circle around the pumpkin’s stalk. Make sure it’s big enough to get your hand in as you will be using this hole to put your lights in. 3. Take the lid out and cut away the stringy flesh beneath. Using a spoon, scrape away the seeds and some of the flesh from inside your pumpkin. It’s a good idea to have a plastic bowl at the ready to keep your work surface as tidy as possible, Halloween pumpkin carving can get quite messy! 4. Now it’s time to get creative! 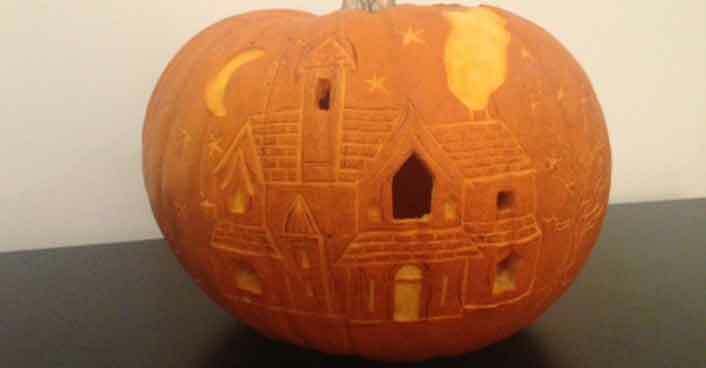 You can outline a simple design or go for something a little more complicated like our haunted house. If you feel confident, use a pen to draw your design directly on your pumpkin. Remember, it doesn’t need to be too accurate as the pen markings won’t show up in the dark! 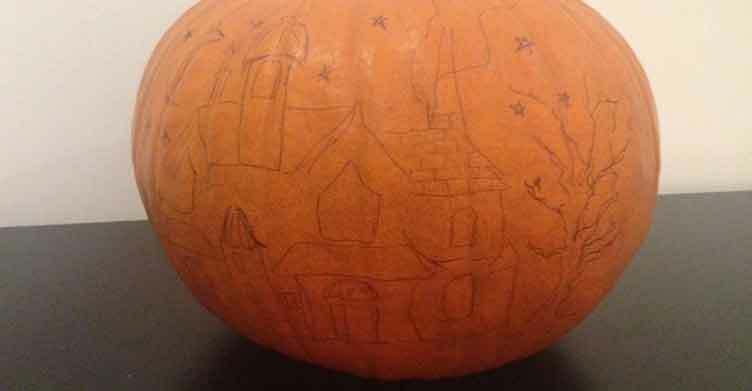 But if you’d rather draw it out on paper first, there’s an easy way to transfer the design onto the pumpkin. 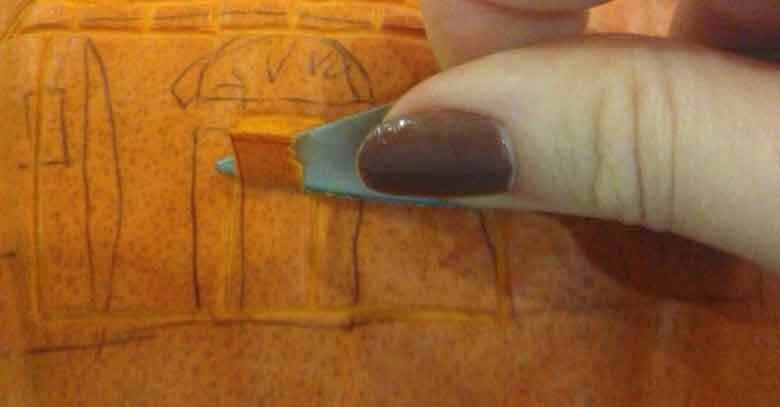 Using pins, pin the outline of your design onto the pumpkin. Once removed you’ll be left with your perforated design and it will be simple to start cutting. 5. Use the small sharp knife to cut the outlines about 3mm deep. To produce thicker lines, cut two parallel lines and scrape the flesh away in-between, as shown in the picture below. 6. Adapt your technique to your design. For the windows of our haunted house, we cut right through the flesh using the tip of the small knife and poking out the middle. To carve the roof, cut four lines running parallel and notch alternate lines in the opposite direction. 7. Add those special details. 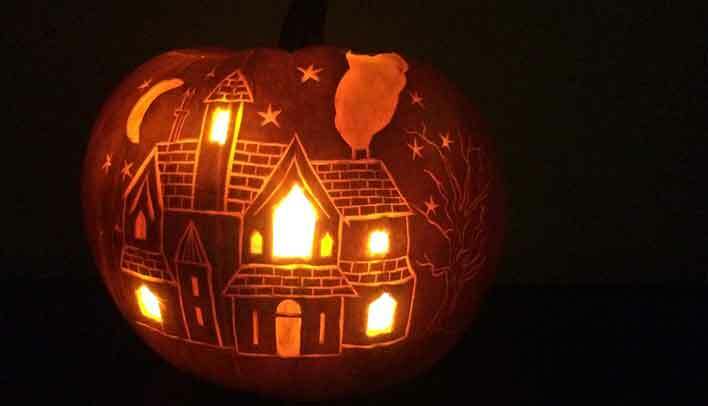 To complete the haunted house Halloween pumpkin carving, add a moon, stars, billowing smoke from a chimney and a spooky tree! If you have extra time, add a couple of bats and some ghosts floating about. 8. Fill the pumpkin with a couple of lit tealights, the more you use the brighter your design will be. But never leave tealights unattended and use battery-operated LED tealights for a safe option. Place the lid back on top and display ready for the little trick or treaters! 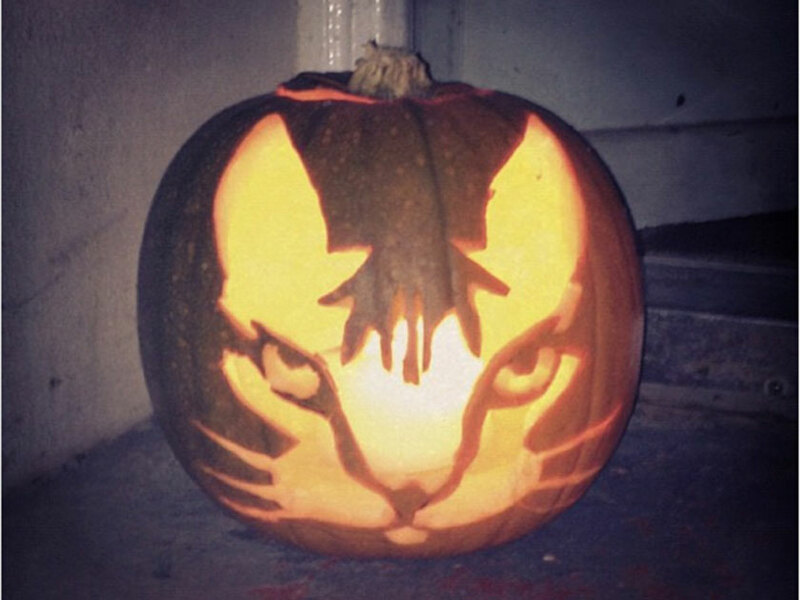 If you enjoyed this haunting design, then why not try creating this creepy cat we carved into our pumpkins too.